Just posted. Who is missing? Can't resist - Atlas and Lionel! Diechman's Depot. I'm not seeing Mr. Muffins either. Look again. Atlas is listed. Diechman's Depot had a liquidation sale at the October show following the owner's passing last spring , though they are still selling on ebay. The people assisting at the stand said it was their last show. Eastern Depot looks to continue their going out of business sale. and Art Schmertzle who used to be across from Lionel passed away last year. I’m probably blind, but I don’t see Mr. Muffin’s Trains on the chart. As far as I know they will be there, aren’t they? Sidetrack Hobbies is listed on the charts. They moved from their old location up into the middle on an end of the aisle. They are right above the GG. I think Mr. Muffin's store is missing this one with all the things going on with his train empire in Indiana. He is actually too busy to dedicate the time to it. I am hoping he shows up as a member for at least day or so. Yes, curious about Mr. Muffin's Trains. His usual spot is allocated to someone else. I was in Atlanta, IN (Muffinville) on Saturday and spoke with Steve. He told me he was attending as a member only. OGR will not be at the April York with our "formal" Orange Hall presence as in the past. That said, Ed plans to be there for, I believe, Thursday and Friday. I will be in York late Wednesday afternoon through early afternoon on Saturday. 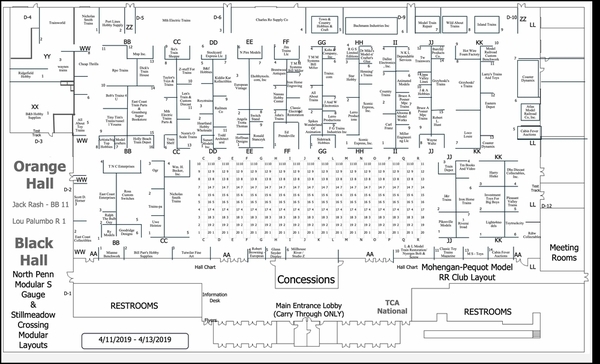 I will be attending as a regular TCA member, but will be wearing my OGR shirt, cap, and jacket and will be circulating through all halls, but primarly the dealer halls. Will be happy to meet with any folks who might want to meet with me. Email me at editor@ogaugerr.com any time between now and York week and include your cell phone number if you have one. I will send you my cell number so we can make arrangements to meet. Otherwise, look for me as I wander aimlessly around. Steve Nelson (Mr. Muffin) tells me he will also be there as a regular member this time around. The writing is somewhat on the wall, I believe. In light of changing demographics in the hobby and ever-rising expenses, many manufacturers and dealers would prefer a once-a-year York Meet, preferably (and logically) in October. That is a decision only the TCA Eastern Division can make, of course, but in the meantime I think it's safe to say that an increasing number of the aforementioned manufacturers and storefront dealers will be cutting back to the October Meet. Individual sellers--the foundation of the York Meet from the very start--will likely be content to keep two meet dates on the calendar, and that is also perfectly fine. You can be sure that the goal of ALL of us is to support and grow our great hobby. But when the hobby is also your business, you do have to keep your business expenses in line and invest your available marketing/advertising/promotional dollars where they will yield the greatest return. I've tried to stay positive about changes in the hobby, in TCA, and at York. Have been contemplating crossing April off the list for a couple of years. I'll be there this time, but the shrinking number of vendors is really starting to concern me. In addition to the names mentioned above, I personally know of one Orange vendor who expects this to be his last York - he has a small booth that most people just walk right past, but he's a great guy to visit with and I'll miss seeing him. It seems like a vicious cycle - fewer members leads to fewer vendors, and fewer vendors leads to fewer members. With all the forces at play, I'm not sure what the answer is, if there even is one. For me going forward, I'm sad to say it will probably be October only until York or I bite the dust. Folks should not lose heart just because there are changes in the hobby that were somewhat inevitable. Other hobbies are experiencing the same thing, but model railroading is still a very popular and viable leisure pastime, and there is no real possibility that it is going to fade into the sunset. There are and will continue to be changes, but those of us who love and support the hobby will continue to do our best to see it grow to new generations of enthusiasts. The young--very young--folks who are publishing Railroading In America Magazine are living examples of the attraction trains, railroading, and model railroading still have to the younger generations who we so often assume are only interested in video games and the like. Added note: The OGR Forum Grandstand Meeting at 2 p.m. on Friday at York is still "on", according to Ed. I don't know what the lineup of presenters will be, but Ed will likely post it closer to the meet week. And I, for one, still plan to be at Quaker Steak and Lube on Thursday evening for the customary forum member get together. Nothing formal planned, but hopefully a good number of forum members and their guests will show up. Time is anytime from about 5 p.m. on. I also plan to attend--for the first time--the Thursday morning breakfast get-together at the Round-the-Clock diner. Notice several Purple Hall dealers are now listed in the Orange Hall. Has a list of dealers in the Purple Hall been posted? Where is Doug Peck, Portline Hobbies? Just to add a little balance to the gloom and doom scenario, there were 182 manufacturers/dealers in the Orange Hall Chart for the October 2018 York Meet and there are 171 in the Orange Hall Chart for the April 2019 York Meet. We know that Lionel, Atlas and Mr. Muffin will not be attending, although Steve will be attending as a Member. Deichman's Depot is closing down because of Len's passing last year, and is done at York. MTH and Sunset Models/3rd Rail will be attending the April Meet. This hardly represents a precipitous decline in manufacturer/dealer attendance. Indeed, many of the top train dealers will be in attendance as usual at the April Meet including: CharlesRo, Grzyboski's Trains, Stockyard Express, Trainworld, Nicholas Smith, Hennings Trains, Island Trains, Norm's Trains and the Train Station, and I may have missed some. There are also smaller train dealers attending as well. Really, the only top train dealer which is not attending the April 2019 Meet that was at the October 2108 Meet and situated in the Orange Hall appears to be is Mr. Muffin's Trains, and that sounds like that was the result of special circumstances. 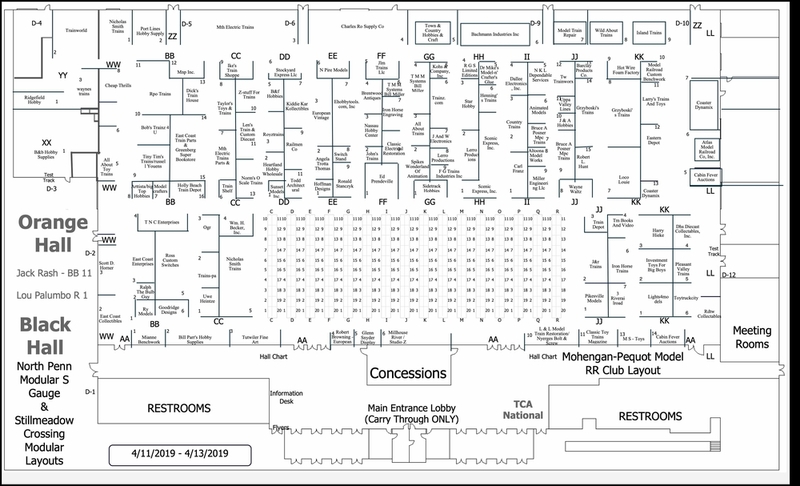 There are also several large train dealers in the Purple Hall Chart for the April Meet, including Just Trains of Delaware and Neely's Trains. I am not a member of the Eastern Division and certainly cannot speak for it, but this is not a picture which would make me think seriously about migrating to a once a year Meet in October. That could of course change in the future, as facts and circumstances dictate. I did not see Die Cast Direct?? Doug Peck is the Purple Hall "veteran" whom I noticed is now shown in the Orange Hall on the back wall corner between Trainworld/Trainland and Kalmbach. Will save me many steps! I was going to York before the manufactures were there and I will be there if they stop coming. I have a great time no matter who is there. So all this angst on who will and who will not be there means nothing. So come and enjoy, I know I will. Doug Peck is the Purple Hall "veteran" whom I noticed is now shown in the Orange Hall on the back wall corner between Trainworld/Trainland and Kalmbach. I could be wrong, but I don't see Kalmbach (Classic Toy Trains magazine) listed in their usual spot. I haven't been in touch with my good friend, Roger Carp, recently, so don't know what they have planned. Another friend from Kalmbach, Kent Johnson, is now editor of Garden Railways magazine, so I guess I won't be running into him again unless I attend one of the garden railroading or Large Scale events (like the one held this past week in the Orange Hall at York). I am in China right now checking samples and the assembly of our E5 and E6 Diesel Production Run, and Golden Gate Depot Heavy Weight Car production. Coming back next week and then off to PA for the York Show the week after. Bob and I will be there showing off our new stuff and taking pictures of the C&O #490 Hudson at the B&O Railway Museum. York has always been a great place to have face time with our customer base and grow that base. Roy'z Trains will be selling our ERR Kits and offering "Free" Advise, if you buy kits that is. There will be new models there and new projects to discuss. The hobby has been good to us. We don't see a decline in overall sales, but we do see reduced audience. I too feel the show should be just once a year and we will probably follow that routine starting next year. I'ts pretty expensive with Airfare, hotel, car rental for a show that should really just be a day and a half. Those were such exciting times. We had people 3 and 4 deep trying to get their questions and comments in. Now, with everyone having 3 days, no one is in a rush for anything. I think the TCA should go back to the old formula that worked and make it once a year. It doesn't matter that much to me who is there and who will not be there for dealers, as long as the members are there. I find some great deals in the member halls. If fewer dealers and members attend, I have more room the negotiate . April meet is always a better time for me to get away from work for a few days. October tends to be more hectic. I mostly go for parts and unique things you just can't find on line or the bay. I understand the cost for dealers can be high but they can limit what and who comes to the April meet by having a smaller presence and still be seen. It seems there will still be OGR guys there as members. Ah, yes, I see them now! So with the "old rules" of giving up your space if you miss a meet, does that mean Lionel permanently lost it's prime corner location and will need to fit into the little cubbyhole next door that Island Trains was in all these years (or whatever other space may be available) ? Yeah, CTT was on my list, but I saw their new spot. That will seem weird. Didn't notice about Kent going to Garden Railways either. I used to like those columns he and his dad did together. They were fun. Just remembering back before the new current Orange Hall was built, when the manufacturers and dealers were in the Yellow Hall under the grandstand, some literally set up in the empty food vendor booths. Lionel had a tent set up nearby with a layout inside. Singer/Songwriter Neil Young was in the Lionel tent some years, getting input for the effort to develop command control. So the York Meet will continue to evolve. Still a great time to meet old and new friends that share our interest in a great hobby, and hopefully draw in new enthusiasts. The member halls are still a good place to find S and O scale bargains, old and new. I have moved this topic to the YORK TCA MEET sub-forum. Brennan's Model Railroading was inadvertently left off the chart. I will be there in my usual spot along with Millhouse River Studios along the wall immediately behind the snack bar.